There many beautiful items produced in Japan that unfortunately are not available outside the country. The same implies for the L-Select customization program available for the Lexus LS. As part of the L-Select program (more info), there are six ‘worlds’ from which to choose the look and feel of your interior. 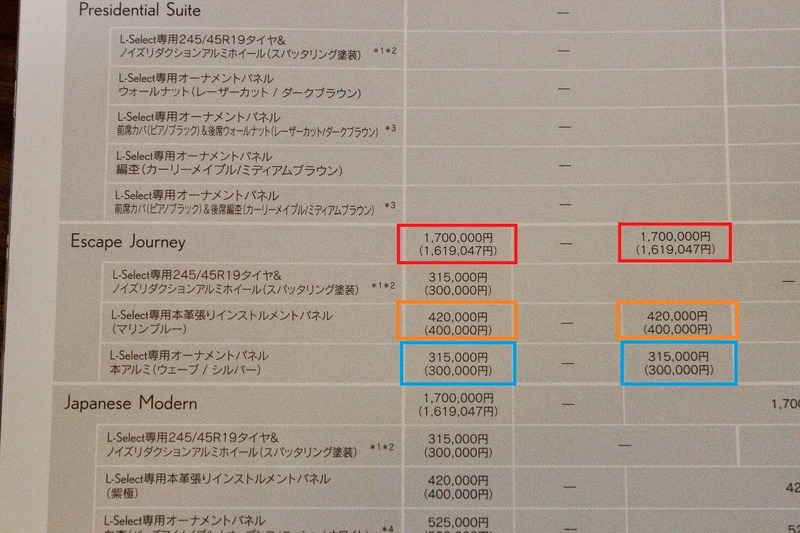 Those "worlds" are the Presidential Suite, Escape Journey, Japanese Modern (my personal favourite), Royal Therapy, Wild Beauty and Passionate Spirit. The most distinct ones are definately the Escape Journey and the Passionate Spirit and although they may seem as extreme at first glance, the craftmanship and colour combinations are simply amazing. The Escape Journey (more info) in particular conjures the image of a Mediterranean style yacht. The Marine Blue (マリンブルー) leather on the dashboard is spread in such a way that reproduces the scene of a steering cruiser aiming at the horizon (Kajiwokiru 舵を切る)! The aluminium trim also conjures the image of how the water reflects light.